We don’t deem to be perfect, but what we do best is persevere. We are just but marriage “practitioners” who happened to have an opportunity to show our scars and impact (hopefully) lives of two beautiful souls. We talked about submission and consequently the husband’s headship in the family. We had a good laugh too about some issues we kept handling the wrong way especially our first year of marriage. Don’t get me wrong. It doesn’t mean that you will experience what we experienced in the exact same way, but I can tell you for sure that “leaving and cleaving” is not an easy task. There is no “easy” in the land of love. Nothing in marriage is done without intentionality. We remembered one particular incident where I had gotten on my husband’s nerves so much that he literally shut down on me. Nothing seemed to get through to him! Not even my wails let a lot my nagging. We both had a part to play in our degraded relationship. We both weren’t modelling the Christ-Church relationship. I wasn’t good in submitting as the church should, my husband wasn’t good in modelling Christ either. Well, neither of us showed the love of Christ. How I love what God has done in his life and mine too! It hasn’t come easy, but God has really worked on us! While there is not room for “bad-mannerisms” just because your husband hasn’t conformed to “your standards”, but like it or not, your wife responds directly to how Christ-like you act. Unless she is really a foolish woman who doesn’t regard instructions, no woman can just be unruly – something has to trigger it (at least from my own experience). Probably you are absent emotionally, physically abuse her, neglect her, ignore her. Women are created to respond and unless she is blunt stupid not to see how well you treat her and the bible calls such a woman foolish – if treated right, the benefits to the man supersede the investment he puts in the wife. Even so husbands should and are morally obligated to love their own wives as [being in a sense] their own bodies. He who loves his own wife loves himself. For no one ever hated his own body, but [instead] he nourishes and protects and cherishes it, just as Christ does the church. Men generally love and look out for themselves. I have never seen a man hate himself not matter how unappealing he looks. Some spend a fortune on themselves. Getting the latest fashion trends in town and investing so hard on cars or status symbols that they otherwise parade – for show off to feed their otherwise starved or oversized ego. Whichever way, they love themselves. As a man you love yourself. But why then is it so hard to love someone else – that person being a beautiful being that God joined you to? Understanding requires hard work of which most husband’s do not like to invest in. How do you gain understanding? By spending time with her to know what makes her tick. By listening to her. By increasing your time together. By learning her language of love. If you learn that she appreciates gifts, then put your energy in! Notice how God calls husbands to love their OWN wives! Not someone else’s. There is no room for looking outside your marriage covenant. You need to till your own land. You need to cultivate your OWN family. You need to nourish your OWN wife. You need to protect your OWN wife. You need to invest in your OWN wife – and make your wife and marriage a priority. You need to love your OWN wife as you love yourself. You should be willing to love her through the seasons, protect her with your strength and your provision should surpass the material gains of this world. You need to love her soul, her heart, her life, her body (and all the changes that have happened), her calling, her all. There should be no one out there who moves towards her with a focused energy like you. You should touch her innermost being and overwhelm her with your kindness for nothing is the ultimate personification of the gospel like the marriage covenant. Your mind should be on her. When people see you, they should see her because you have projected her as your main and only agenda. Well, it’s easy to think that once you say, “I will love her right”, things will automatically fall in place. It’s not just about trying harder, it’s all about relying on the power of the Holy spirit. Only the Holy spirit can rid of the pride, the chauvinism, the ego-centrism, or perhaps the “tyranny of urgent” that tends to spin you off the radar, pulling you towards others and not your family. Allow Christ to teach you how to live in understanding with your own wife and he will teach you how to love her sacrificially. 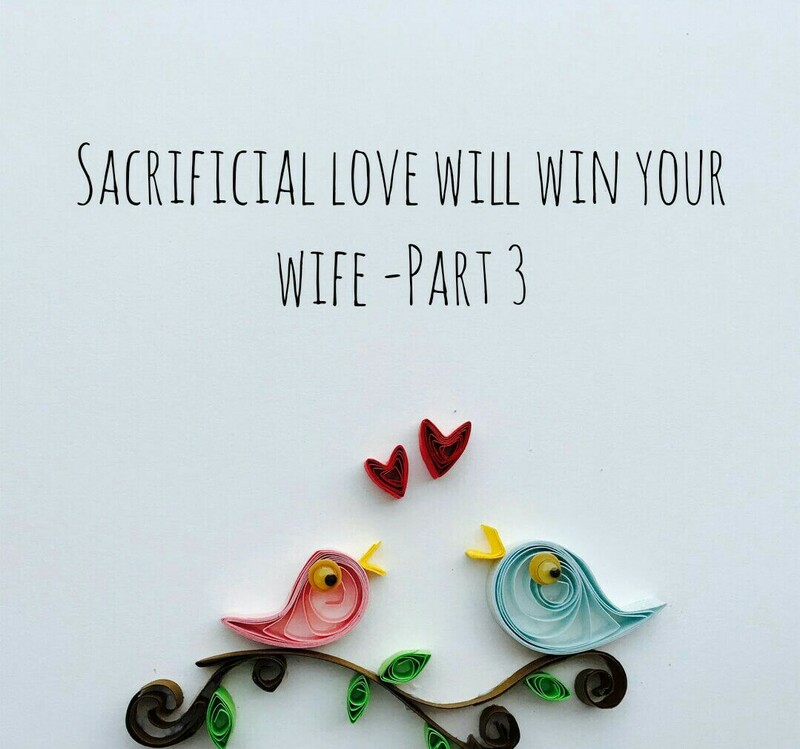 Next PostSACRIFICIAL LOVE WILL WIN YOUR WIFE - PART 4 _ Caution to the Husbands!